Social media is a very hot topic. News papers, magazines and social media are being filled with stories about them. Users have embraced them. And now companies and organizations have started using social media for marketing, corporate communications and HR purposes. But how are companies actually using social media? And how are they organizing their activities? To answer these questions, Bram Koster, together with Jungle Minds –the leading internet consultancy in the Netherlands–, performed research amongst 155 Dutch companies. In his presentation, Bram will share the results of this research with you. Bram has been working in internet and marketing related roles for over 12 years. He has consulted or worked for companies such as Unilever, Ericsson, McCain, Rituals, Organon and AkzoNobel. He is currently working as Marketing & Communications Manager for ODMedia, a company specializing in video on demand services. 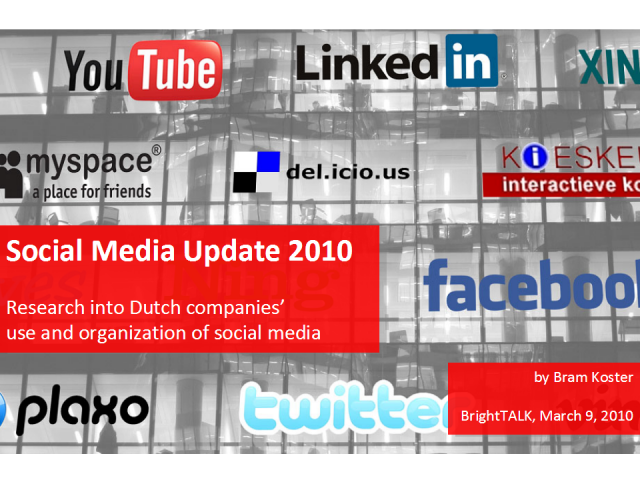 In Q4 of 2009 he led the research into the use of social media by Dutch companies. Bram holds an MBA from the Rotterdam School of Management and an MMM (master of marketing management) from Erasmus University Rotterdam.